Saba has spent her whole life in Silverlake, a dried-up wasteland ravaged by constant sandstorms. The Wrecker civilization has long been destroyed, leaving only landfills for Saba and her family to scavenge from. That's fine by her, as long as her beloved twin brother, Lugh, is around. But when a monster sandstorm arrives, along with four cloaked horsemen, Saba's world is shattered. Lugh is captured, and Saba embarks on an epic quest to get him back. Did you miss yesterday's? Here it is! I loved Blood Red Road, and it's really interesting and cool hearing it on audio! I enjoyed Heather Lind's work on Clockwork Prince by Cassandra Clare so this appeals to me. It would be interesting to hear this one on audio. :) Thanks for the giveaway! I have been dying to read this book! Would love to listen to it :) The narrator seems to fit the voice of the book pretty well. I love the narrators voice. I have listened to a few audiobooks where the female narrator has a softer voice and it has always kept my attention. I think it would work for this one. This narrator sounds a lot like the first book's narrator. Not too bad, could be a good listen. This is a tough one for me. I like the readers voice, but I don't think she is great for this book. I feel like the dialect isn't really coming out the way I imagined it while reading the book. I think I would still like the audio though since I do like the reader. Hmmmm...this one is just ok for me. I have been wanting to read this book and think it would be great as an audiobook! The narrator seems to read it well with a lot of personality. Thanks for the amazing giveaway - I would love to win! I have really wanted to read this book and have heard so many great things about it. I really like this narrator. I think she is the best one this week. Love the reader of Blood Red Road. She fit the book and character so well. 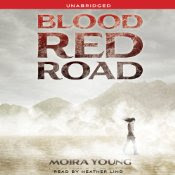 Her narration of Blood Red Road is what got me hooked on audio books. Of all the readers so far, I like this one the best. She's amazing! Her voice isn't monotone and flat, and for the different characters her voice changes are perfect. She fits Saba's slang into her speech amazingly! Wow, that was a long exerpt! I really like the narrator. I feel like I might have listened to one of her books before, but I can't place it. I actually listened to this book. I think the reader is really amazing. I love love love her voice. Wow, the narrators voice is perfect for this book. Free stuff is the best in the world! I agree with Brandi, I listened to Blood Red Road with this narrator in its entirety and she is WONDERFUL. She is just how I imagine Saba...this is one of my fave Dystopian novels ever & I cannot WAIT for Rebel Heart!!! I like this narrator - sounds young but not like a little kid. She still has her youth, but also awareness of the situation around her. Whoa! So cool to havr free audiobooks. I'll add it to my collection. Thanks a lot for this. I liked this reader. She has a very easy to listen to voice.